Oregon Law requires that the Commission deliver a report to the Legislature every two years. Generally, the Commission uses the reports as a platform to educate and inform legislators and the public about current critical climate facts, policies, and strategies. These are described below for each report. Questions or comments about our reports? Contact us! The “future" effects of climate change, predicted over the last three decades — drought, flooding, heat, sea level rise, public health effects — are now arriving in Oregon, challenging Oregon communities, businesses, and households, and heralded by the wildfire smoke that has choked Oregon towns from Ashland to Sisters to Portland over the last two years. Meanwhile, Oregon is no longer gaining ground in its greenhouse gas emissions reduction efforts. Emissions from electricity and gas use stayed flat or declined while transportation emissions are rising. This 2018 Report informs on these two themes. The OGWC Forest Carbon Accounting Project Report answers some questions and raises others in an area of carbon policy that many overlook, including: (1) the very substantial contribution to global carbon sequestration that Oregon’s abundant forests already play; (2) what strategies are available to increase carbon uptake in our forests; and (3) what tools and tradeoffs would need to be considered in that case. It also looks at implications for Oregon’s forest carbon of wildfire, harvest, land conversion, and climate change. Learn more about the Forest Carbon Accounting Project. The 2017 Report to the Legislature focuses on an in-boundary inventory update of Oregon's greenhouse gas emissions, which shows an increase in emissions in the state - largely due to higher transportation emissions. The report includes a new emissions forecast: Oregon will miss its 2020 target, and is not on track for its 2035 and 2050 goals, even with an updated Renewable Portfolio Standard and phase-out of coal-produced electricity. 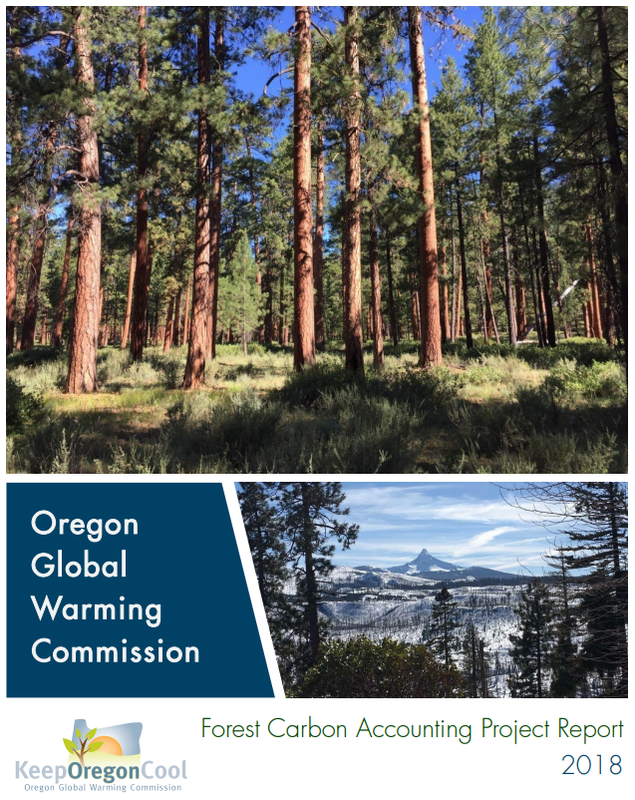 Forest Carbon: the report also opens a Commission inquiry into Oregon's forest carbon stores and flows – which are in the millions of metric tons – as a first step toward recommendations to the state on how these stores should be accounted for, managed, and potentially enhanced. Unlike much of the world’s forested lands, Oregon forests appear to be net accumulators of carbon stores, opening possibilities for our state to become part of the global solution to reducing atmospheric carbon. The 2015 Report to the Legislature describes two years' worth of data from GHG-emitting facilities and energy suppliers. On the plus side, emissions levels have come close to 1990 levels, and we have seen real reductions in emissions per capita and per dollar of state GDP. On the other hand, projections show emissions are unlikely to reach Oregon’s 2020 goal of 10 percent below this 1990 mark. Given these discouraging conclusions, the report describes a new intermediate 2035 level adopted by the Commission, which allows the state to revisit its commitments and the ways and means of achieving realistic reductions. Wedge Analysis: to assist state agencies and Oregon jurisdictions, the report offers a “wedge” analysis based on (1) energetic implementation of existing program measures such as energy efficiency and clean vehicle fuels, and (2) a carbon tax (or cap) that can make up the difference between programmatic gains and fully achieving the state’s emissions reduction goals. It suggests that a carbon tax beginning at $10/ton and leveling out at $60/ton would accomplish our goals. Consumption-Based Emissions: the report updates Oregon’s “consumption-based” greenhouse gas numbers (see our 2013 Report, below), showing an unsettling rise since 2005. These numbers look at the emissions for which Oregonians are responsible in the sense that we are using the goods – the flat screen TVs, the sneakers – that are made elsewhere and shipped into Oregon. The 2013 Report to the Legislature is the first time the Commission has been able to report on Oregon's greenhouse gas reduction goals. The report includes emissions tracking data from 2010, which shows Oregon has been able to arrest the growth of GHG emissions so far and to meet its first state goal. Roadmap Report Card: The report includes a report card on how Oregon is doing in implementing the Roadmap recommendations included in its 2011 Report to the Legislature. The Roadmap contains many detailed recommendations in six emissions sectors, but identified 40 of them as key. While significant progress has been made on some of these actions, on balance we were able to give no better than a C+ grade for implementation progress. Consumption-Based Inventory: Oregon showed national leadership in measuring and beginning to track its consumption-based greenhouse gas emissions. The Commission and the Oregon Department of Environmental Quality describe how Oregonians use goods and services that cause emissions elsewhere – in China to produce sneakers; in Japan or Korea for flat-screen TVs. If we add these emissions to our state total and subtract Oregon-sourced emissions for goods we export for others to use elsewhere, we are left with the emissions resulting from our consumption. By throttling back on those consumed goods and services – including their production, transport, use, and disposal – we can each reduce our real carbon footprint. 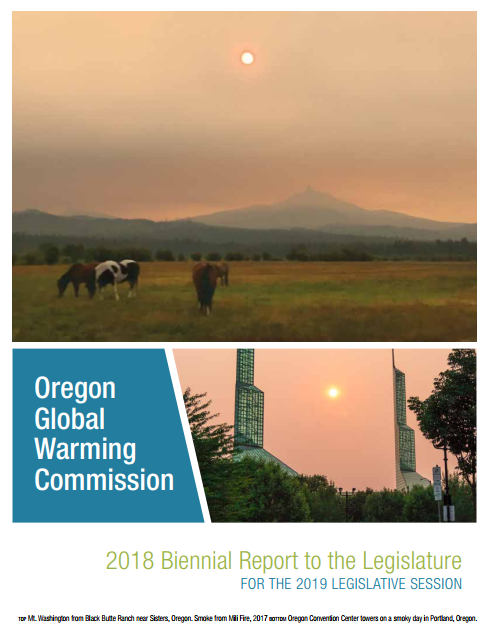 The 2011 Report to the Legislature reviews Oregon's ongoing climate change goals. 2008 data shows emissions have declined since peaking in 1999, but in recent years have oscillated around a flat trajectory, which the Commission expects to continue through 2010. The report also discusses the Roadmap to 2020 project (see below), where six technical committees convened to work on sector-based strategies for meeting emissions reduction goals. The Commission's Roadmap to 2020 project is designed to help steer Oregon to get a head start on reaching the state's 2020 and 2050 GHG reduction goals. Six technical committees brainstormed specific actions sectors could take to reduce emissions. The sectors included: energy, land use and transportation, industrial, agricultural, forestry, and materials management. The Roadmap was incorporated into the Commission’s 2011 Report to the Legislature, above. The Commission's first set of recommendations affecting a wide range of climate change issues, including cap and trade, promoting energy efficiency, supporting renewable energy, adapting to the impacts of climate change, and more. The Commission's Subcommittee on Fish, Wildlife, and Habitat Restoration completed this report to outline a plan for preparing for climate change in natural systems. The report focuses on the management of fish and wildlife populations and their habitats, reviews four basic guiding principles to complete the work, and offers recommendations for developing policy to support fish and wildlife adaptation.